Few signatures of faith do it with such breezy panache. The prayer flags of Buddhism – a vivid surprise, an impermanent gateway, strung over the deserted toad between rocks or pillars of earth. They are new, not weathered, flirting with the sun like blue, white, red, green and yellow beads. Each is an ode to the earth, fire, water and wind, the belief fluttering in the wind, my eyes gain focus as I realize that Ladakh of the mind’s eyes has just turned real. “Julley”, a delightful greeting, variously good day, welcome, thank you or god speed. The word strikes a familiar chord in me, I have come to my alternate home once again, away from the hustle and bustle of the city life I am back to amongst the mountains and their beliefs. This article I would be speaking about the high altitude lakes that I have visited in the Ladakh and the adjoining region during, my travels. There are many more out there and hopefully some day in the future I would get a chance to run an update on this article as and when I have a first-hand experience on the shores of those that I am yet to visit . The first of the lakes , at an altitude of 3750 mts. Generally I have always crossed this lake while the sun is still preparing to light up the day , the chillness of dawn out here is a welcome initiation to the traveler about the best that is yet to come. My visits out here with the Sun rays kissing the peak tops, the still waters of the lake reflecting the image of the surrounding peaks and the glacier that feeds this lake. During the months of May-Aug, this lake wows everyone with its greenery and reflective visual. There are few tenting options in peak season but come late September, everything shuts down and one would only see the occasional IOC tanker trundling past or stopping by for few moments. The pleasure of having tea on lonely mountain roads, now this is a different altogether, it gives a totally different perspective to the moment as one holds a hot cup of tea in the hand and gazes upon the mountains of snow spread across the entire vision of the eyes. After Deepak Taal we continue on our way to the Lake of the Sun, Suraaj Taal. As we were still in Himachal, the lakes are called “Taa”l instead of the Tibetan word “Tso”. The road goes on and on twisting and turning as we climb higher and higher into the Pir Panjal, a red Logan in a world of brown mountains and white snow beneath the electric blue sky. I found Suraaj Taal much more inspiring than Deepak taal , the lake has its own unique long sharp features and was shimmering in the morning sunlight. Welcome to Suraaj Taal, the second highest lake in India at an altitude of 4883 mts. The beauty of the lake and its sudden appearance surprises the traveler and leaves a long lasting impression. Do pause for some visuals however caution that the road is constructed on the mountain slope and is very narrow hence a stationary vehicle can create problems for those coming from ahead or behind. The lake is the source of Baga river which flows and unites with the Chandra river to eventually form the Chenab river as it passes through Kashmir. This jewel of a lake on the right side of the road is passed by many in their hurry to reach Pangong however it is prudent to spend some time here and soak in this beauty. The lake has the capability to mesmerize and I definitely suggest a stop here. The semi frozen lake in early season enthralls all those who are perceptive enough to see and feel it. At an altitude of 13500 feet it is easy to miss in the blink of an eye if one is not looking out for it . Pangong Tso which in Tibetan means the “ Long Narrow Enchanted Lake” is a 134 km long lake which is situated in the border between India and Tibet. located at an average altitude of 14200 feet, having a physical dimension of 134km length and 5 km width. The uniqueness of this lake is that it flows across the international border into Tibet, thereby straddling two countries. Out there is goes by the name “Bangong Co”. The lake is noted for its crystal clear blue brackish water which keeps playing tricks and changes colors in seven distinct shades of blue, green, purple, turquoise, violet depending on the angle of view. The shores of the lake are white with salt deposits while in extreme winter, the entire lake just freezes and presents a mesmerizing sight. The panorama of the golden mountains is reflected on the lake surface and presents an exquisite sight indeed. It is said that in the Chinese controlled part there exists a small section which is a popular birding area for hundreds of migratory birds. As I descended from a audacious attempt to reach Chushul from Mahe using a rarely used road hacked into the mountain ranges, I glimpsed something blue and it made me realize I was looking at Mirpal Tso, an elusive lake seen in pictures of those very few who had come here. Slow meter by meter I moved ahead and yes meant it when I say metre by metre Every few meters I used to stop and lie down to inspect the underneath of the vehicle as well as the condition of the tires, so brutal is the punishment meted out to those who take the courage to come visiting Mirpal Tso. Mirpal Tso was bewitching as she shimmered beneath snow covered peaks. I cannot relate the feeling, one has to be here to experience it and words can never do justice. The rawness, the beauty, the absolute solitude, .it was mesmerizing as well as frightening. The sedate Yaye Tso, beckoned me from distance nestled at the base of a huge mountain. I could feel the aura of peace that it radiated. This lake can be easily reached from the settlement at Mahe past the nunnery that is run at Mahe. The road climbs crazily upwards into the mountains as one moves towards the high altitude pass known as Horla beyond which lies Yaye Tso . Kiagar Tso, a beauty in itself, not much is spoken and it loses when tourists go ga ga over talk about Pan gong and Tso moriri in the same breath. But ask the discerning traveler and he will go quiet for a moment and his eyes will attain that glassy look as he transports his soul back to his moment spent by Kiagar Tso. Such is the beauty of this lake, it is a hidden beauty and only reveals when you pay attention to it The taxis carrying the tourists hurl pass it intent on reaching Tso Moriri in time for lunch or maybe dinner depending upon the time but my suggestion have a packed lunch by this lake and you will relish it whenever you think about it for all the years to come by . Trip advisor reviews can never convey what this lake is all about for they cater to the tourists and not to the traveler. Come out here to understand what the words I have written mean. There is so much to explore out here, I knew I was only scrapping the surface of the it, after a while I went out, drawn by the magnificence of Tso Kar Lake. The lake situated at an altitude of over 14700 feet in the Rupshu valley where I stood, returned my gaze as the white shimmered off its banks. The salt that was deposited on its marshy banks dissuades many a traveler from reaching till its banks, however I made the effort drawn by the cachous cries of the birds that had made this lake their home. Tso Kar is a bird watchers’ paradise and is home to Brahmni ducks, bar headed geese and the elusive black necked cranes. The twin lakes Ryul Tso and Chilling Tso at an altitude over 5000 mts are around 40 Kms from Hanle and further along the route one can reach Thit Zarbo La. This is total Changspa Country and one has to keep in mind that the guard dogs are not very welcoming to strangers and once they get their jaws in, it is only the master that they will listen to. The lakes have gained prominence in recent years and come winter they free totally however in spring and autumn, they are a lovely sight to see and are a favorite picnic spot for the villagers from Hanle. There are many more magical lakes , some known while the other are just names but i am sure i will see a few more of them , Ladakh will call me again soon enough ……. wow! Fantactic photos| I really enjoyed seeing these shots, they give a great value to your post on Ladakh! The pictures were like postcards! Awesome shots and place! Lovely minimalist landscape photos! I especially like the b/w. Reminds of Ansel Adams. Pangong Tso! The beautiful lake in the movie 3 Idiots. I love that place and I hope to be able to visit that place too. However, I have read that one of the negative aftermaths of the lake’s having featured in the movie was the sudden influx of tourism. Which created a few eye sores in the area. Ladakh is a land of landscapes that transport you into a magic land of tranquillity. The lakes look so ethereal and each one of them seems to possess some kind of unique and mystical aura. I am sure it was a blessed experience at the lakes. Nice pictures bring alive the beauty of the place. The pictures are just stunning! 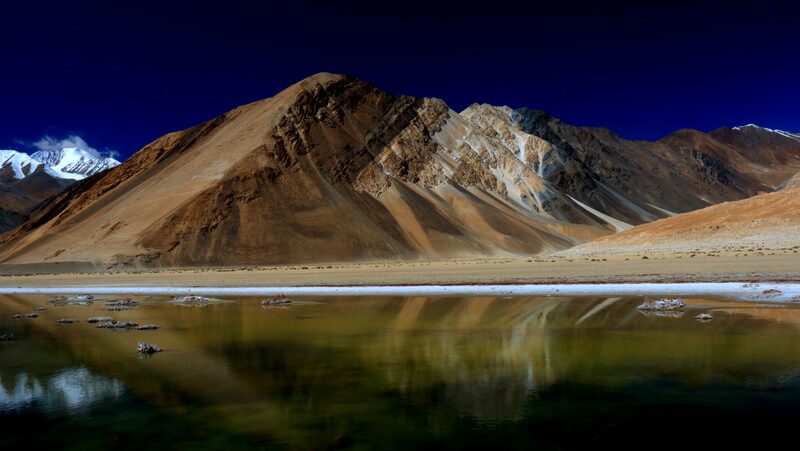 The reflection of the stars in Pangong Tso’s lakes are amazing. Fantastic and amazing photos! Looks like a great trip…I’d love to go someday! I love that you explained what the place names mean…I really enjoy little details like that. Great post! Your shots were amazing, it made me want to go and visit! Ladakh currently is my favorite place. Pangong Tso is no doubt beautiful but I also, loved Tso Moriri , despite it being cloudy and we not being able to see it in its full glory. Tso Kar – I saw as we drove past it and it was beautiful. I wish I had seen the others, but some other time. Such a lovely post Sumit. Loved all the lakes you have covered, the pristine solitude where these lakes rest add to the allure. While we have all seen pictures of the two famous ones, I loved Kiagar Tso . It is mesmerizing. I went wow so mnay times reading through your post. The contrast, depth, sense of freedom and space in your pictures… Liberating in a way! You have captured the essence and beauty of these lakes perfectly! Ladakh is one of my top destinations to visit and this post has reaffirmed my love for the moutains and lakes! Your writing is inspiring!